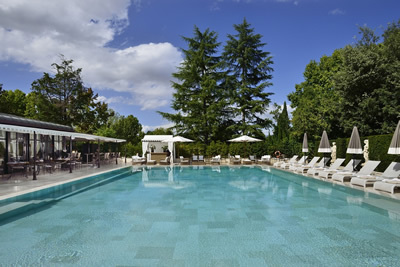 In an affluent part of Florence, on a hill overlooking the ancient city centre in the distance, stands a grand 19th Century villa, which has been wonderfully restored and turned into a luxury hotel. It was built in 1868 for Baron Gustave Oppenheim. At this house were entertained many of the great and good of the day, including the composer Peter Ilyich Tchaikovsky. The good Baron was evidently a man of eclectic tastes, and the sumptuous interiors of his mansion were created – without the sparing of expense – in various, contrasting styles. To walk through them now, in their newly pristine state, is a heady experience. 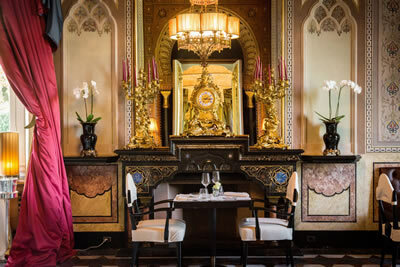 The Moorish Hall – with its Oriental ceiling and fresco by Antonio Caremmi – houses an admired restaurant, Le Bistrot. Or, to be more accurate, it does in the winter months. My visit was at a time of sunshine and warmth – and so the restaurant had done its seasonal move to the attractive summer house by the swimming pool. Here I was met by the Restaurant Manager, Giampiero Puddu, who showed me to a table on the terrace, right next to the water. Here, ensconced in a supportive metal armchair with cushions, I admired the crisp white napery and the good glasses by Spiegelau, as the waiters in brown aprons went about their duties, which included bringing to my table three different sorts of salt. 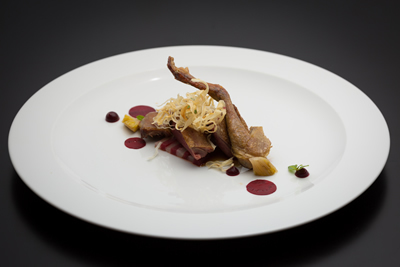 The Executive Chef Alessandro Liberatore offers a five-course tasting menu for 95€. I chose four courses from the carte (123€). 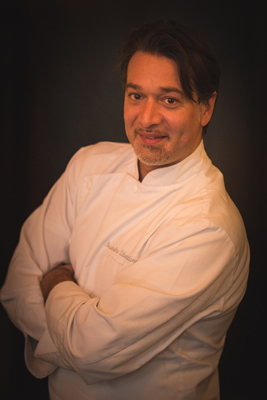 Chef Liberatore’s cuisine is sophisticated in conception and execution, and prettily presented – although it includes a selection of simple dishes (steak and chips, for example), for those who do not wish to stray from the basic favourites. My first course was spectacularly good. Now that the PC Brigade has driven foie gras from the menus of so many dining rooms, I tend to eat it whenever I find it. Here it was offered with the appearance (and the name) of Crème Caramel – the luscious liver delicately flavoured with lemon, rosemary and almonds. The precision and skill involved in the production of this dish impressed me enormously. For it alone the journey to the Villa Cora was worthwhile. Then it was on to linguine with lobster, followed by some rich and tasty pork belly with red onion, green apple foam, roasted celeriac and braised endive. I finished with a de-constructed tarte tatin, described as ‘tartatin’: puff pastry with raw milk ice cream and candy apple transparency. I enjoyed dining at Le Bistrot. 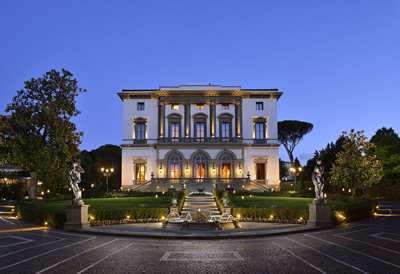 I can recommend this restaurant at the Villa Cora. Viale Machiavelli 18, 50125 Florence, Italy.